What types of merchant account are there? Home» FAQ » What types of merchant account are there? “Swiped” merchant accounts: These types of merchant accounts and virtual merchant accounts usually have the lowest rates because it requires an in person transaction, which means there is less risk. The credit or debit card is swiped through a machine to make a purchase. “Keyed” merchant accounts: These types of merchant accounts, or virtual merchant accounts, usually have a higher rate because there is more risk. In these transactions the credit card numbers are entered manually, usually on a website or through a phone or mail order. 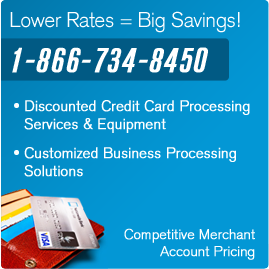 Generally fraud is higher for these types of merchant accounts so the rates are slightly higher. Have more questions about types or merchant accounts and what type of account your business needs. Call us at 1-866-734-8450.